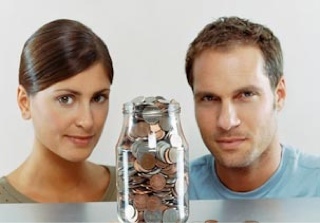 If you are married or in a living in situation with your special someone sometimes money becomes an issue. If one is earning more than the other party and you're used to splitting expenses, how are you going to split the bill? Naturally, what can we think of is to divide the bill 50% each. It is logically correct but for the less earning party, he or she is actually paying more. If you have been watching or following Suze Orman, her way of splitting the expenses is by equal percentage. In that way, both parties are paying equally . So let's say HUSBAND is earning $3200 while the WIFE is earning $1800. Combined income is actually $5000. Now, compute your monthly average expenses. So let's say you have $2000 in joint expenses, you can arrive with the percentage formula of EXPENSES over COMBINED MONTHLY INCOME or $2000/$5000, which will give you 40%. From that base percentage, multiply each of your monthly salary to that. That amount is actually your equal share for your monthly expenses. What do you think of this computation? this is actually a rather brilliant idea! i bet a lot of married couples, or not as long they are sharing household expenses, can benefit well if they practice this percentage sharing of expenses. I know a married couple here who does not incorporate their salary in one, they also split the expenses. In our household, there's only one budget, hubby's salary and my income goes in one. if i and the boyfriend will finally live together it will be his income alone as we agree to save my online earning for future and usage..
My husband pays for our living expenses while my income is reserved for our recreation and vacation trips. It always is a good thing when the couple arrives at a fair decision when it comes to splitting on the financial aspect. This sounds like a really good idea. Now a days, economy tanked, we gotta watch every pennies we spend. Gotta save and budget things and take control of our financial. THanks for sharing this one. Great idea! I know a lot of couple that are fighting about money.